Together, we can send some Holiday cheer to our local troops currently stationed overseas! Deployment can be a lonely and stressful time, especially during the holidays. But receiving letters & care packages from members of their communities back home can remind our men & women in uniform that we appreciate them & all that they do to keep us safe at home. While they’re a world away from family & friends, we want to provide them with some basic comfort items and things to occupy their free time. From November 1st through December 1st, 2017 we will be gathering items in our office to be sent to local troops overseas for the Holiday season. 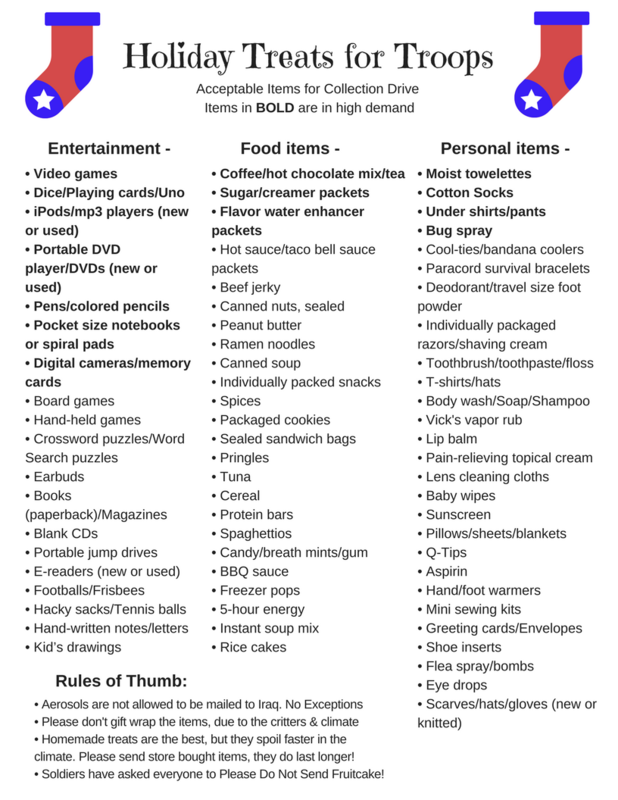 Below is a complete list of accepted donation items. But by all means, if there is something not on our list that you feel the troops may like to receive, please bring it in! We encourage you to get creative! Many times, personal letters of gratitude, notes, pictures of home, or children’s drawings are their favorite items to receive! We will also be accepting cash donations, which will be converted to gift cards that may be utilized by soldiers overseas. Items will be collected at RE/MAX Heritage located at our NEW Office: 116 N Main St., Fond du Lac. Our office hours are Monday-Friday from 9am-5pm. If unable to drop off items during normal business hours, please call 920-923-7777 or email info@wesellfonddulac.com to schedule a drop off time. We will also gladly pick up donation items if located within the Fond du Lac area! Prev: You’re Invited to our Holiday Customer Appreciation Party! !